ESA’s Trace Gas Orbiter circling Mars since October 2016 this week finished a delicate aero-braking campaign of nearly one year that moved the spacecraft from a highly elliptical orbit into a nearly circular Low Mars Orbit in preparation for a final set of trimming maneuvers and the start of a highly anticipated science mission. 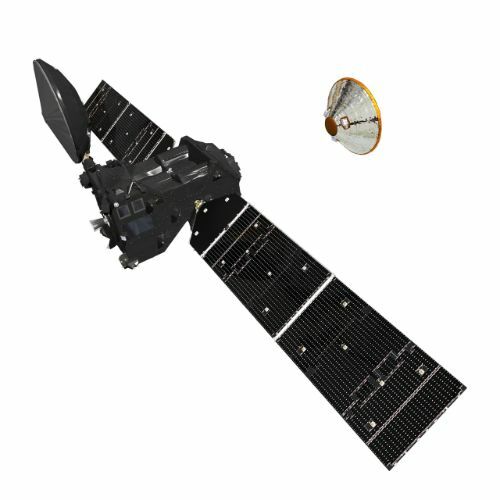 As the primary component of the ExoMars 2016 mission, the orbiter now sets out on a science mission of at least four years and it builds an orbital relay point for rovers exploring the Martian surface. 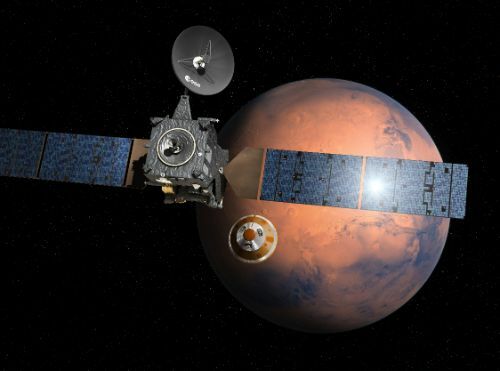 The 4,300-Kilogram ExoMars 2016 mission – comprising the 3,750kg Trace Gas Orbiter and the 577kg Schiaparelli lander – launched atop a Proton rocket in March 2016 and enjoyed a smooth interplanetary journey toward Mars arrival on October 19, 2016. 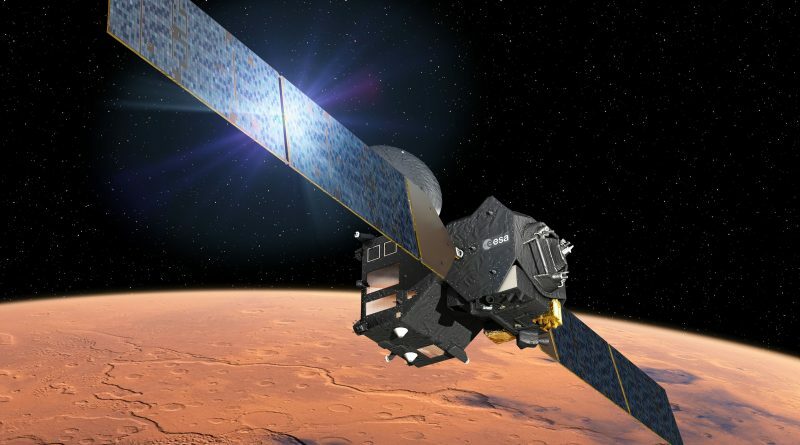 Heading off in different directions, the Trace Gas Orbiter successfully fired its main engine for over two hours to be captured in Mars orbit while the experimental lander remained on an intercept course to attempt a daring landing maneuver to pave the way for the ExoMars 2020 mission featuring a Mars Surface Platform and Rover. 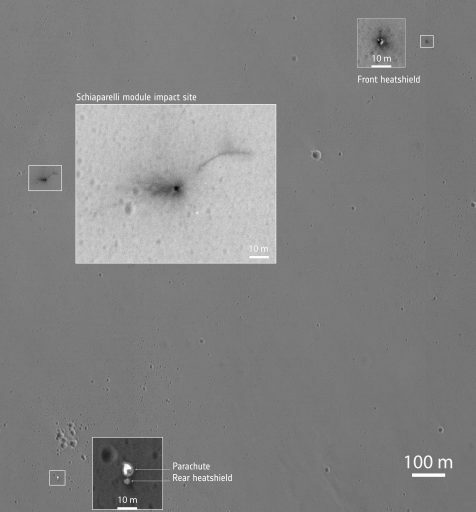 Schiaparelli’s landing attempt ended with a 34 second free fall and 150-meter-per-second impact on the Martian surface after its navigation equipment had become overwhelmed due to higher-than-expected body rates at the deployment of its supersonic parachute – sending the inertial sensing system and navigation software into disarray. Although unable to complete its soft landing, Schiaparelli delivered valuable lessons to increase the odds of success for the ExoMars 2020 mission. For the Trace Gas Orbiter, the mission started out in an orbit of 298 by 95,856 Kilometers around the red planet – still with a ways to go in order to reach its circular science orbit of 400 Kilometers from where it will be able to probe the Martian atmosphere. 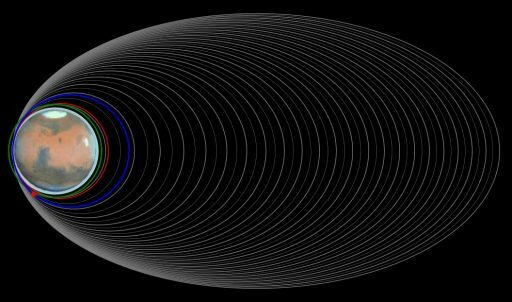 Taking 4.2 days for one lap around the planet, TGO completed a pair of science checkout orbits in November 2016 ahead of a series of four propulsive maneuvers in January and February 2017 that shifted the spacecraft from an orbital inclination of seven degrees – a result of Schiaparelli’s landing zone requirement – into a 74-degree orbit from where the spacecraft can cover the majority of the planet. The main engine burns also reduced the orbit’s peak altitude to 33,200 Kilometers. While the plane change required the use of the spacecraft’s main engine, spiraling down from the elliptical orbit to the science orbit would have gone beyond the possibilities of the mission’s propellant reserves. Therefore, trajectory planners devised an aerobraking strategy that would slow the spacecraft down by 1,040 meters per second and save 600kg of propellant by skimming the upper layers of the Martian atmosphere for over 900 successive orbits – essentially using the craft’s solar arrays as drag sails to slow down and decrease the apoapsis altitude with every low pass through the outer atmosphere. In March 2017, TGO conducted another pair of science checkout orbits before Europe’s first-ever aerobraking campaign at Mars began when the craft’s periapsis altitude was lowered in a stepwise fashion to ease TGO into the sweet spot of the changing Martian atmosphere that expands and contracts as the result of solar activity – much like Earth’s atmosphere. A total of seven thruster burns were executed, first lowering the periapsis to 150 Kilometers and then proceeding in smaller increments as part of a careful walk-in phase to account for uncertainties in atmospheric density. 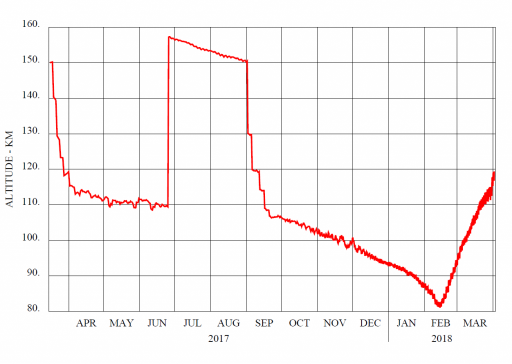 Aerobraking began in earnest on April 6, 2017 when the periapsis had been dropped to 113 Kilometers and was then carefully maintained between 103 to 113 Kilometers for subsequent weeks. 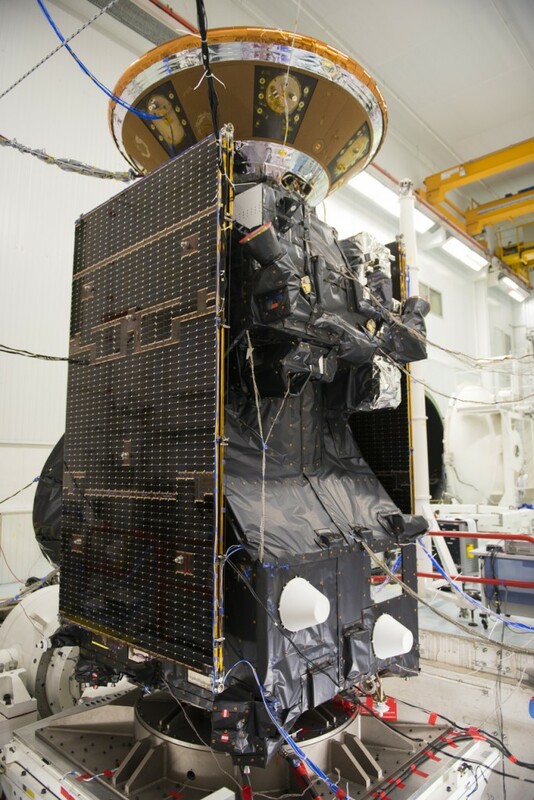 By June 25, TGO had reduced its orbital period from 24 to 14 hours and entered a two-month summer break around the solar conjunction period during which reliable communications with Mars are not possible as the sun moves into the line of sight between Earth and Mars. 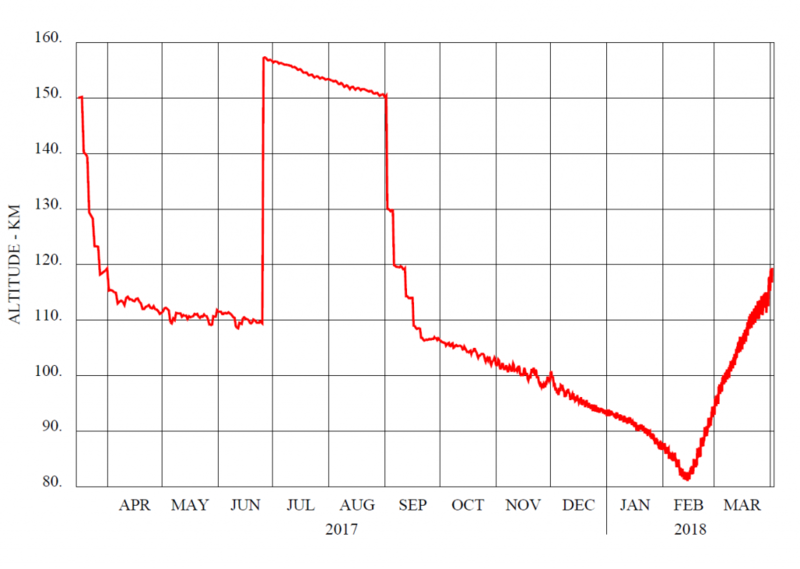 As aerobraking resumed at the end of August, Mission Operations at ESA’s Space Operations Center in Germany shifted into a more rapid pace as the orbit period of TGO required command uplinks on a daily basis, increasing to every few hours as the craft continued spiraling down. Several safety features were built-into the aerobraking campaign including an autonomous capability for TGO to pop-out of aerobraking and raise its periapsis altitude in case any onboard parameters violated limits or atmospheric deceleration crossed pre-programmed thresholds. By the end of January 2018, TGO had crossed the three-hour mark for orbital period after over 740 aerobraking passes that delivered a total delta-v of 782 m/s. Aerobraking ended on February 20 when TGO completed a 16-minute thruster burn to move its periapsis out of the atmospheric corridor and place itself into an orbit of 200 x 1,047 Kilometers. Up next for the Trace Gas Orbiter is a series of up to ten orbit-trim maneuvers that will deliver it into the proper science orbit at an altitude of 400 Kilometers, taking just two hours for a lap around Mars. 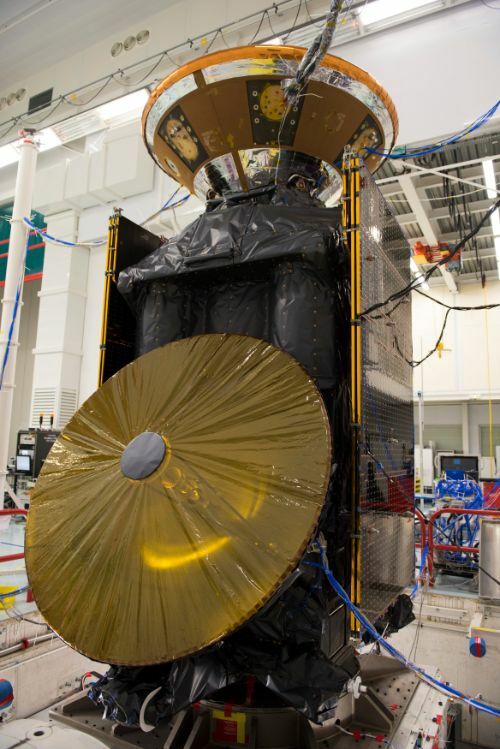 Preliminary science observations are expected to pick up around mid-March for instrument calibration and validation from the proper working altitude before routine science observations start formally on April 21. Regular long-distance calls between NASA’s Mars Rovers and Earth with TGO as a relay point should begin in the summer time frame. TGO is outfitted with four science instruments – a pair of spectrometers to identify atmospheric species down to extreme trace amounts, a color & stereo camera to obtain imagery of potential sources & sinks of atmospheric trace gases, and finally a radiation monitor to measure the radiation dose encountered on the transfer to Mars & in orbit while also studying water deposits in the sub-surface. Over the course of its mission, TGO will be tasked with taking a detailed inventory of trace gases in the Martian atmosphere, making up less than 1% of the atmospheric volume. These include water vapor, nitrogen dioxide, ozone, acetylene and methane which has been a focus of scientific study for the past years as findings suggest methane can temporarily occur in the Martian atmosphere.